Few photos have amazed me by their mere existence, but this one did. To give you some perspective, that handsome devil on the right lived 200 years ago. Photography hadn’t even been invented when he was born. If you follow this blog, then you know that Willem Vlietstra, the grandson of my great-great-great uncle’s sister-in-law, has been sending me some old photos from an album that was passed down to him. If you’re new to this blog, well, you’re caught up now, but you should also know that the album has labeled photos, which helps immensely in identifying the ancestors in pictures (not all generations had the foresight to label such things). Wubbina Engellina Haken, my great-great-great-great grandmother, at left, was born to Jantje Hinderks Fols and Geerd Jans Haken in Boen, Ostfriesland, Germany, in about 1825. 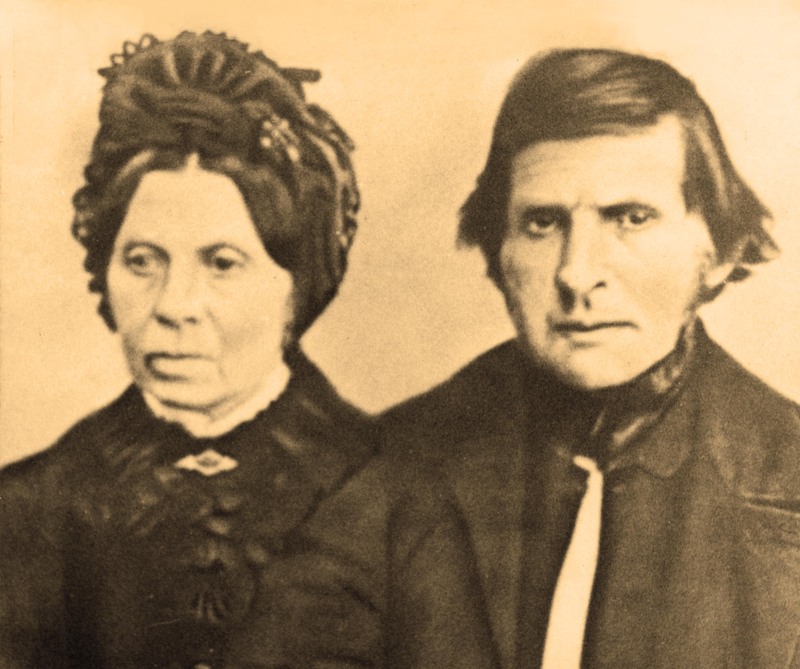 Engbertus Freerks Swalve, at right, was born to Daje Engeberts Brouer and Freerk Bellinga Swalve in Landschaftspolder, Ostfriesland, Germany, in February of 1812. Most of the information I have of Engbertus (and for that matter most of the Swalve side of the family) comes from Roger and Marilyn Coeling Peters, who have their detailed Ancestors and Related Families project online. A big part of why I find this so interesting is that Engbertus’ brother Beene, and two of his sons — Freerk and Heinrich — also worked as bakers in Beverwijk, North Holland, Netherlands. Beene was a bread baker, and Heinrich had his own bakery, which he told Willem about when Willem was a boy. I am certain they all must have been very tight-knit, coming from the same family and all residing in the same city. In fact, disregarding traditional naming conventions, Freerks’ second daughter, Lucretia Anna, was named after Beene’s wife. And she was born in a bakery, as was her sister Wubbina Engellina Johanna Petronella Swalve. But, ah, before I get too far off track, a little more on Engbertus and Wubbina. They had 11 children over an 18-year period, although not all of them lived into adulthood. Their son Engbertus Freerks Swalve also followed in the elder Engbertus’ footsteps and was a master baker in Bovenhusen, Ostfriesland, by 1892. The elder Engbertus lived until he was 61, passing away on April 30 in 1873 in Böhmerwold, Ostfriesland, Germany. Wubbina lived until she was 64, passing away on Sept. 7 in 1889. All those dates and places are from the Coeling Peters’ Ancestors and Related Families project online, so don’t forget to check their site out. It even has footnotes and an organized index. Pretty much I’m in love with it. Editor’s note: I cleaned up the photo a bit in Photoshop to eliminate some dust and discoloring along the top. Hi, such a beautifull photo :). my great, great, great, great grandfather was Heye Geerds Haken, married to Geeske Bloem and brother of Wubbina Engelina Haken. The son of Heye Geerds Haken and Geeske Bloem, Heiko Haken (born 1874 Bellingwolde )was my great, great, great grandfather, he married Klasien Kieviet, born in Bunde, Germany. My grandmother, daughter of Heiko and Klasien was Johanna Maria Haken, born Kieviet, she married Meindert Kruize.